A FIVE-PART, FIVE WEEK PUNISHER EVENT! • A Special Forces soldier is injured and his family killed in the midst of a mob execution in Central Park, but this isn't Frank Castle. This time it's a young soldier named JAKE NIMAN, but the familiar story puts Frank on the path of punishment! • As Jake Niman heals from his wounds, why is he growing strangely stronger? • And who is the mysterious Johnny Nightmare? 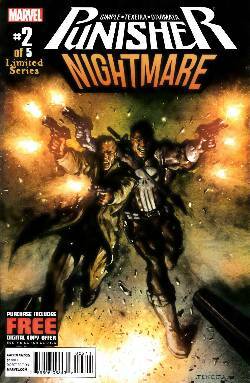 • Bullets fly, anarchy reigns, allies become enemies, the Punisher becomes the punished, and no one is safe!! !